A strangely painful-sounding title, wouldn’t you say? I’m a bit worried how this will turn out, but I promise you won’t end up with a wedgie or a splint as a result of reading it. The end blocks hold the two halves of the soundbox together. They are important for the structural integrity of the guitar, particularly the top block that has to absorb the stress of the neck joint under string tension of around 70kg weight. 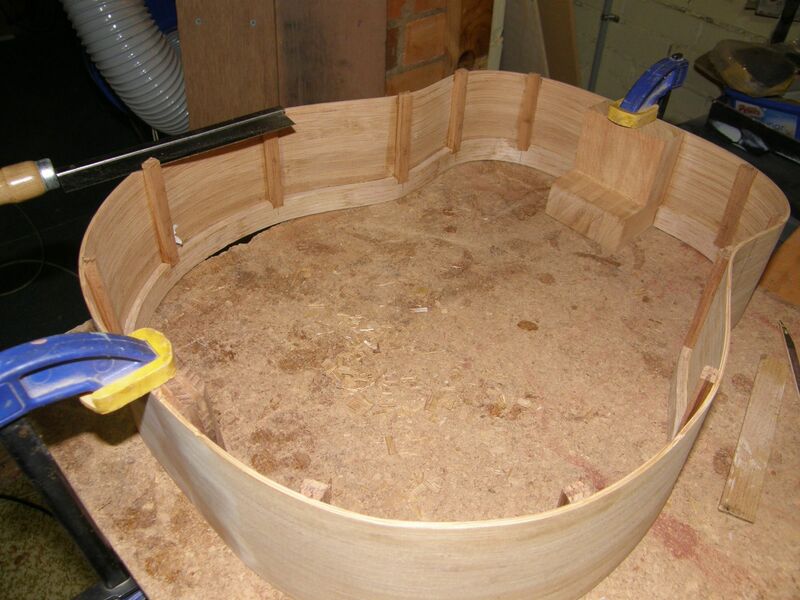 It has to be a substantial chunk of wood accurately fitted to the soundboard, sides and back. That 70kg weight is another reason I like laminated top linings – imagine an adult man standing on the end of the guitar. The front face of the block is shaped to fit by temporarily taking the sides out of the construction mould and sticking some adhesive backed sandpaper where the block will land. The block then gets sanded to an exact fit – and I do the same with the tail block before putting the two half sides back into the mould. Both blocks then need to have a channel cut into them to fit the 18x6mm top linings. Some careful shaping is needed to get a good fit, because of course the linings have a subtle curve to them. When there’s a good fit I glue them both in place with firm clamping. The tail block will have to support the strap button and the jack for the pickup, so again I laminate it up out of four 4mm thick pieces with grain crossed to stop it splitting if the guitar is ever dropped on its end. In this picture you can clearly see the notches in the top lining waiting for the side splints. It’s customary to cut away the sides where they join at the tail and replace them with a nicely-contrasting wedge of wood – here I’ve used blackwood. To get a good fit. I make the wedge first, clamp it to the guitar and carefully cut into the sides, and then remove the waste with a chisel. The subtle shape means the when you tap the wedge into place it fits very tightly for a hardly-visible joint. 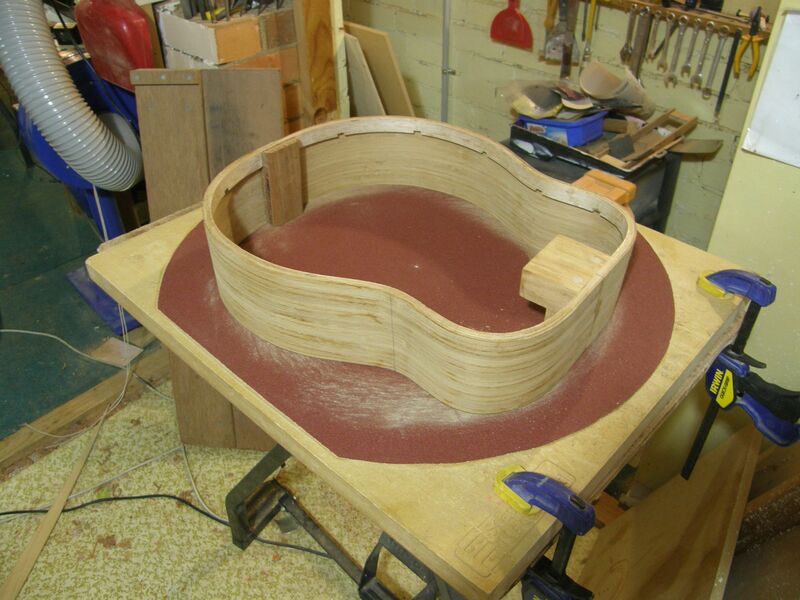 Once the tail wedge is in and trimmed off, I profile the bottom edge of the soundbox before I glue in the side splints (in all the pictures so far, the guitar is resting in the 20′ radius sanding dish). No matter how hard I try, somehow the sides never match the designed profile and I have to adjust them. The side splints in a guitar are small strips of wood glued vertically to the sides between the soundboard and the back. 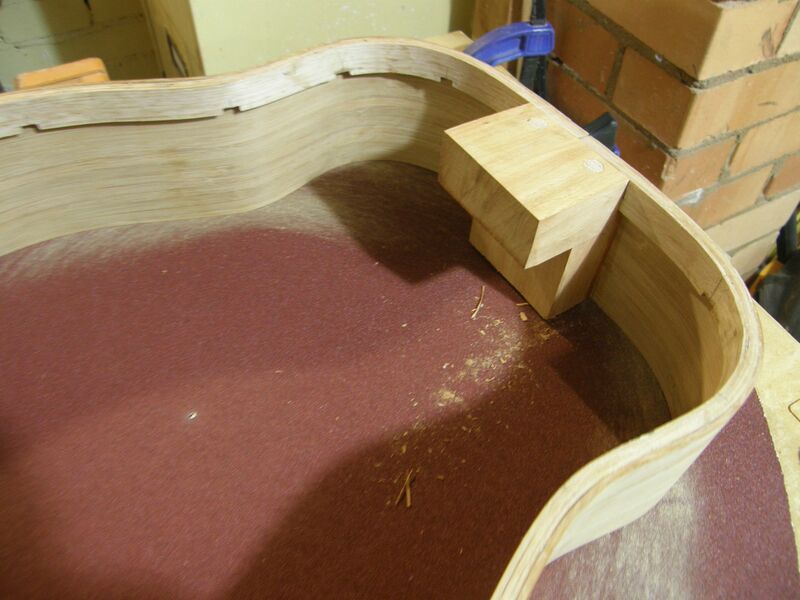 They reinforce the side panels by crossing the grain to stop splitting, and they add extra rigidity. They are quite important, as Gore and Gilet point out, because when a guitar is played, at the simplest level of analysis the soundboard and the soundbox necessarily move out of phase with each other. The more rigid the soundbox back and sides are – that is, the more the behave like a single unit – the more efficiently the soundboard can vibrate. So I take my splints seriously now, where before I used to slap in a few little matchsticks made from scrap spruce and move on. I now laminate them from hardwood and notch them carefully into the top and bottom linings. I make them from three 2mm laminations of leftover Blackwood, so they’ll be the same 6mm thickness as the top linings. They’re 9mm wide, and carefully shaped to fit the curvature of the sides. 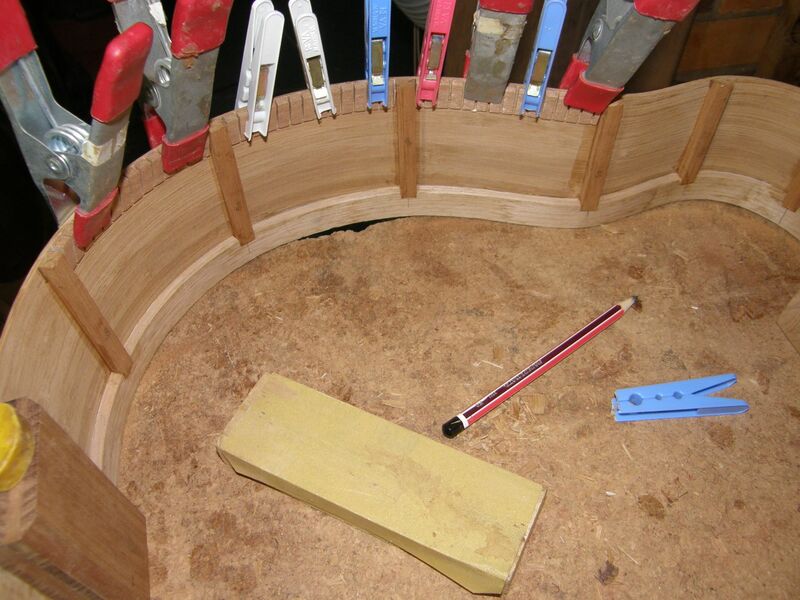 It’s much easier to fit the splints a bit over-long, then trim them with a saw to match the depth of the side panels – otherwise you’re left sanding end grain when doing the final profiling of the back. The last task before fitting the back panel is to install the kerfed lings. I fit them by bending a length of the lining around the curve between each side splint, mark the length, and cut the length off with a bandsaw. If they’re cut slightly overlength you can fit them exactly by sanding the ends. 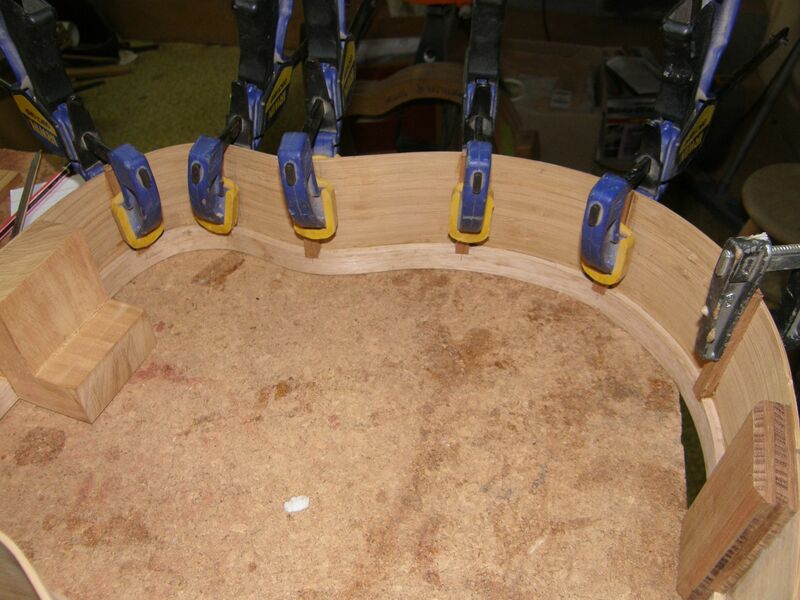 Each piece is glued in, and they need to be clamped. I use spring clothes pegs, with the odd more powerful small spring clamp when needed. The thing to look for here is that the lining fits well against the sides. Because you’ll be working with the soundbox face down, you can sometimes get an unpleasant shock when it’s all finished – you proudly turn it the right way up and find the top edges of the linings are standing slightly away from the sides. With a bit more work in the sanding dish the linings and the ends of the side splints will be profiled exactly to mate up with the back plate when it’s ready to fit. 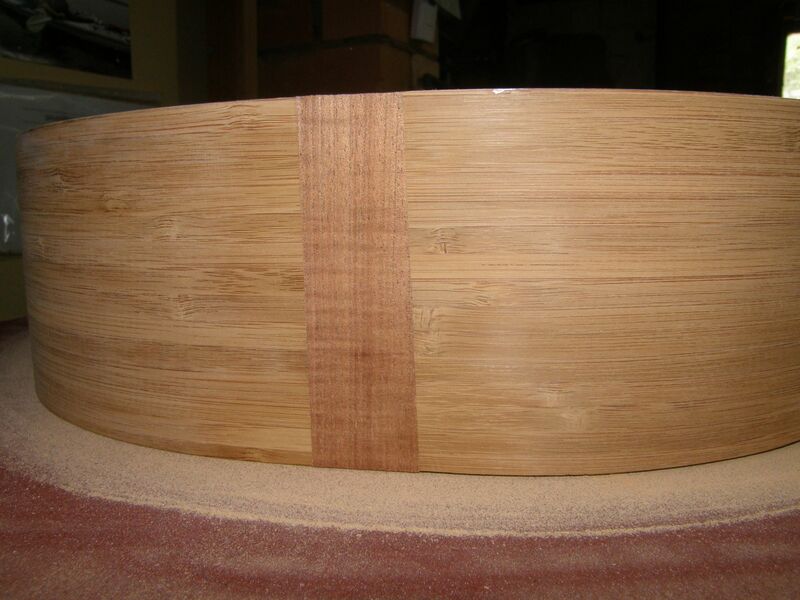 This entry was posted in Bamboo guitar, Guitar construction and tagged kerfed lining, laminated, sanding dish, side splint, tail block, top block, wedgie on November 13, 2013 by Michael Williams.